Large waves crash along the San Diego coast in the first moments of daylight. 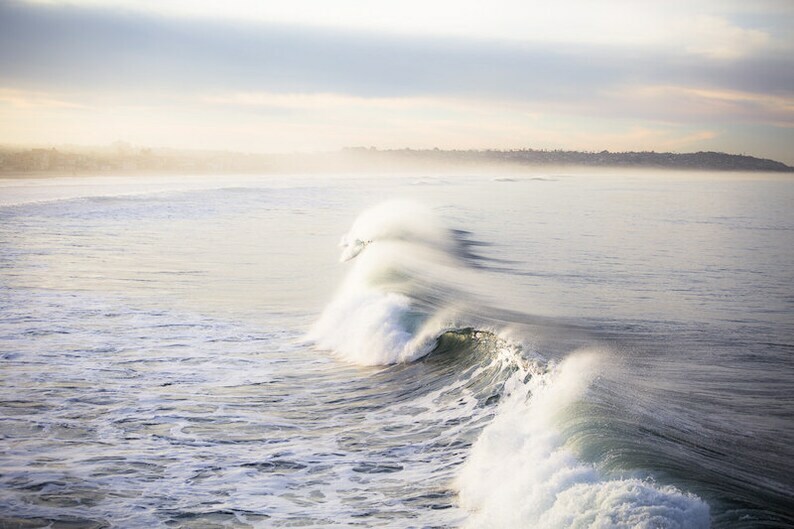 I love shooting waves at sunrise because the sun highlights the curve of each wave so beautifully. Each photograph is professionally printed on premium archival paper guaranteed to last 100 years. A high quality luster finish enhances the vibrancy of the print . Prints are mailed un-matted and un-framed in a protective sleeve inside of a rigid cardboard mailer to ensure safe arrival. If you have any questions, or would like this print in a custom size, please don't hesitate to contact me! The quickest way is to send me a convo, or you can email me directly at ColorPopPhotoShop [at] gmail.com. Beach Decor, Beach Photography, 8x10, Seashell, Coastal Home Decor, Beach House Art, Nautical Decor, Wall Art, Beach Shell - "Waves of Sand"